First Student of the Year, then Main Tera Hero, and now Humpty Sharma Ki Dulhania (“Humpty Sharma’s Bride“). Three films into his career, and Varun Dhawan has positioned himself as Bollywood’s hero of the future. Humpty Sharma Ki Dulhania (HSKD, henceforth) is made in the mold of classic romcoms, most explicitly Dilwale Dulhania Le Jayenge. [Though references to DDLJ are sprinkled throughout, one need not have seen that movie in order to appreciate HSKD.] This requires Dhawan to carry the film with his dancing, crying, and goofing around, and he’s more than up to the task. Dhawan plays Humpty Sharma, a good-natured college student prone to slacking off. He’s destined to take over the campus bookstore from his tolerant father (Kenny Desai), so why push himself in school? Humpty’s constant companions are Shonty (Gaurav Pandey) and Poplu (Sahil Vaid). The trio are busted by Kavya (Alia Bhatt) when they try to extort passing grades from their history professor, her uncle. When Kavya agrees to fix their grades behind her uncle’s back in exchange for a bribe, the guys recognize a kindred spirit and friendship blossoms. Humpty and Kavya fall in love, even though she’s engaged to an American guy she’s never met. Humpty must convince Kavya’s father (Ashutosh Rana) to let him marry Kavya instead of her betrothed, Angad (Siddharth Shukla), a nearly impossible task given that Angad is perfect. Angad’s perfection sets up some especially funny scenes. Despite his loyalty to Humpty, heterosexual Poplu finds himself becoming enamored of Angad’s winsome demeanor, delicious cooking, and chiseled abs. Big thumbs up to the casting department for hiring Shukla, who looks like Superman. Angad is also great for driving home the film’s theme that most people aren’t perfect, but that doesn’t preclude us from being loving partners or from striving to be better versions of ourselves. In an effort to differentiate Angad from Humpty, debutant writer-director Shashank Khaitan finds the right balance in making Humpty flawed but likeable. None of his weaknesses are deal breakers, and values like love and loyalty govern all of his decisions. Kavya is likewise written with a moral code. Her sense of justice is what first appeals to Humpty, making up for her short fuse and selective materialism. Bhatt — whose had an even stronger start to her career than Dhawan after debuting alongside him in Student of the Year — is very good again, especially in quieter interactions between Kavya and Humpty. It’s a shame that her character’s dynamism is sublimated in the second half. Humpty must try to save their relationship mostly by himself, whereas he and Kavya had been partners to that point. Dhawan is the total package: good looks, dance moves, and nuanced acting skills. He comfortably transitions between comedy and sexually charged romance. Strong performances by Pandey and Vaid augment Dhawan’s performance and reinforce Humpty’s status as a good guy. The supportive and empathetic women of Kavya’s family make the story feel complete. The story’s weakest point is that some of the supporting characters are denied satisfying conclusions, or any conclusion at all. Khaitan so effectively populated this universe that the movie becomes about more than Humpty’s and Kavya’s will-they-or-won’t-they romance. But for light romantic comedy, HSKD hits the spot. It has some inventive dance numbers and strong turns by a pair of Bollywood’s brightest up-and-comers. It’s definitely worth a watch. 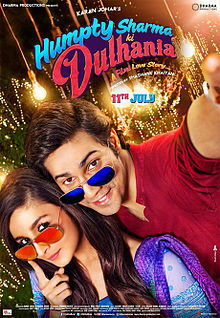 This entry was posted in Reviews and tagged 2014, 3 Stars, Alia Bhatt, Ashutosh Rana, Bollywood, Dilwale Dulhania Le Jayenge, Gaurav Pandey, Hindi, HSKD, Humpty Sharma Ki Dulhania, Humpty Sharma's Bride, Indian, Kenny Desai, Movie Review, Sahil Vaid, Shashank Khaitan, Siddharth Shukla, Varun Dhawan on July 11, 2014 by Kathy. Dhawan Jr. does it again. Now the guy needs to switch it up with a mindless action movie a la Salman Khan or a boring and dialogue heavy dramatic thriller or a gritty, hyper real crime drama to branch out his range a bit. I’m looking at you Vishal Bhardwaj and/or Prakash Jha! Varun Dhavan did great job too, and thanks god his character not the type of stalker dude who trying hard to win girl attention. However I think he should step out from college boy character in his next film.